A political tussle over a cockamamie border wall shouldn't be taking food out of people's mouths. As the partial government shutdown reaches toward its one-month mark, the impacts of the dispute in Washington, D.C., are being felt everywhere, including here in Washington County. No matter what side of the standoff you fall on — whether you support President Donald Trump's long-touted border wall along the Mexican border, or Democrats' hard stance against it — there's little doubt that it isn't Trump or Speaker Nancy Pelosi who are struggling right now. It's the men and women in our communities who work for, or deal with, the federal government. Right now, the shutdown shows little sign of ending. We hope that changes — soon. Read our Jan. 15, 2019, story on how the government shutdown is affecting Washington County. For many, a shutdown is a minor inconvenience, if it's noticed at all. But it's important to remember that the people impacted by the shutdown live and work right here in Washington County. For one local example, look no further than Hillsboro Airport. As the second-busiest airport in the state, planes and helicopters take off from Hillsboro all day and night, but the shutdown is making things there difficult. Much has been written in the past few weeks in The Oregonian and nationwide about workers with the Transportation Safety Administration, who are working without pay at Portland International Airport and commercial airports across the country. Hillsboro, thankfully, doesn't have TSA agents stationed there, but the airport's air traffic controllers are at work today, forced to put in a day's labor without pay as they ensure that planes continue to soar over Washington County. Customs and Border Protection officers — who are also staffed at Hillsboro Airport — are also working without pay. Here's a fun fact: Hillsboro is home to the Federal Aviation Administration's field safety district office, the only one of its kind in the state. The regional office is in charge of overseeing nearly all aviation operations in Oregon, including enforcing rules and safety standards. Without them on the job, there's no one to do enforce those rules. Without them, trainees at Hillsboro Aero Academy can't take the tests they need to receive their pilot's licenses, which impacts one of the largest flight schools in the country. And it's not just local airports feeling the crunch. The shutdown could mean impacts for local wineries and breweries, since employees at the Treasury Department's Alcohol and Tobacco Tax and Trade Bureau aren't working. Without approval from government workers, many craft breweries and wineries here in Washington County aren't able to bottle or sell any new labels, which could impact their business. Any new startup wineries or breweries can't open their doors without federal approval, either, which could spell disaster for businesses just getting started. The attorneys at the federal courthouse in Portland are forced to work without pay, representing a government that doesn't believe they need to be paid for the privilege. Local offices of the Internal Revenue Service are closed; that might not bother you too much, but it doesn't mean you won't have to pay your taxes this year — just that a backlog of work is building up, while thousands of IRS employees aren't getting paid. Thousands of agents and intelligence analysts with the FBI are furloughed, too, taking people charged with protecting our national security off the job. Visitors to Crater Lake must ski or snowshoe the seven miles from Highway 62 into the park, thanks to the shutdown. Crater Lake's website gives visitors this chilling reminder: "Visit at your own risk." Native American tribes across the country, many of which rely on federal money, are also struggling as roads go unplowed, food services grind to a halt and police officers go unpaid. Thankfully, The Confederated Tribes of Grand Ronde has managed to weather the storm, but tribal leaders warned this week that the shutdown could impact their planned election in February, when members will decide whether to allow non-tribal siblings who have brothers and sisters in the tribe the ability to enroll. If Trump's threats are true and the shutdown lasts into February, there won't be any Bureau of Indian Affairs employees to run the election, which would need to be rescheduled. As Democrats and the president continue to argue, local organizations are stepping up to help. 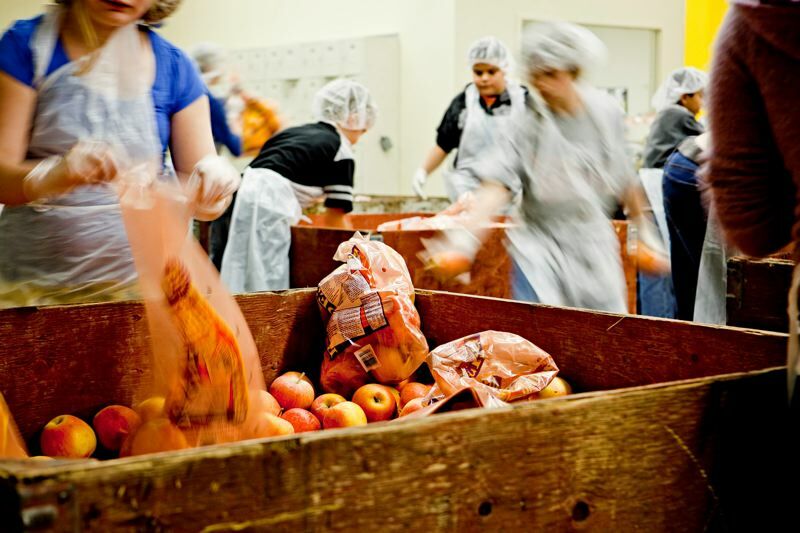 The Oregon Food Bank is working to get food to people who are struggling during the shutdown. They have an office in Washington County, a stone's throw from Hillsboro city limits. SNAP benefits — formerly known as food stamps — and funding for Women, Infant and Children clinics are stable through February, according to the state. WIC provides food, breastfeeding support and healthcare referrals to families free of charge. God forbid the shutdown last into February, but this is already the longest government shutdown in U.S. history, and with the president proudly proclaiming the shutdown could last "months or years," it's important that people be prepared for the long haul. Just how people do that is unclear. Furloughed employees — and those forced to work without pay — have little options when it comes to paying rent and keeping food on the table, other than to seek employment elsewhere. The U.S. Coast Guard posted on one of its websites advising military servicemembers to host garage sales and "become secret shoppers" to help with the rent (that "helpful" suggestion has since been deleted). The Office of Personnel Management — which handles the government's human resources, retirement benefits and other services for federal employees — suggested in late December that federal workers impacted by the shutdown should barter services with their landlords, offering to paint or do carpentry work in exchange for lowering rent payments. Both of these ideas have drawn the ire of social media, and for good reason. The men and women impacted by this fiasco aren't responsible for the problem, but they're caught in the middle. People will be evicted because of this, made homeless because the president would rather engage in a staring contest over a stupid wall than sign legislation backed by members of both parties to keep thousands of men and women working. We don't want to make this editorial all about the Trump administration — although we don't support the president's plans for the wall, which would do little to stop the real problem with illegal immigration, namely people who enter the United States legally but overstay their visa. Instead, we want the spotlight of this shutdown fixed squarely on the men and women across Oregon who are impacted by this. Politics is often described as a game, but this game has real and serious consequences for the men and women who do the day-to-day work keeping this country running.